We came to know about Facebook Reactions, a new way to express your feelings. Currently, the Facebook Reactions are available in Spain and Ireland, but I thought for a while, “Why shouldn’t I give it a try?” And boom, it’s not very good or very bad, I just think it has both positive and negative effects. But, how did I get it? May be you’re also curious about that, so in this tutorial I will show you how to do that. And yes, it will be a very short one and you can understand from the video below, which I have recorded just a few minutes ago to show how you can access it from anywhere. Did I like it or hate it? As the title of the article suggests, it’s also about the early impressions. So, I would like to talk a little about this new feature. I think it’s better than the dislike button, as with a dislike button there will be no differnec between Facebook and some others like YouTube, Reddit or Quora. This is a great way to express many things, and Facebook’s main aim seems to be successful- To make a reaction for the most common expressions people use in the world. So, basically without writing ‘Ha ha’ we can just express that at the click of the mouse. Just like that we can have the most common expressions ready right at the fingertip, but there’s always a ‘but’. Well, that ‘Angry’ reaction, may be you will find some retared guy using this on even a good update or pic or anywhere on Facebook and you can’t stop him. Again, there wil be stupid games like balancing the number of likes and ‘Angry’ reaction. Sometimes, people will be like, use the ‘Love’ reaction, one ‘Love’= 1 prayer, and much more. I think it could go better with just limited number of reactions- Ha ha, Yay, Sad, Wow, Like. 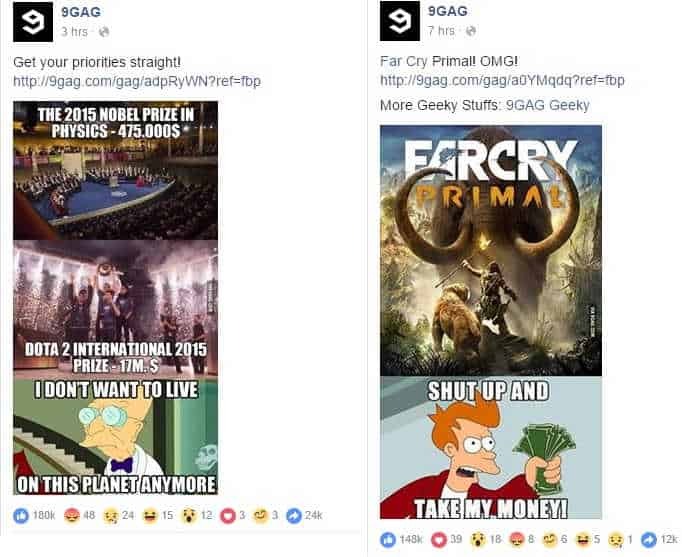 Actually, I feel pretty disturbed with that, I even saw people using this, and that too spotted on 9Gag’s official Facebook page. So, as you can see, for raising a sensible question I think Dota Players are angry, at the same time when they talked about the Far Cry Primal (I can’t wait…I can’t wait) non-gamers got offended. Basically, the ‘Angry’ reaction can be used for spreading hatred over Facebook, already we see people spreading that over religious matters on Facebbok, hope with Facebook Reactions things don’t go worse. That’s all, I’m no one to make a decision, let’s see what Facebook finds out after pre-release in Spain and Ireland and probably, we may see some changes as well in future.